Last night the wind howled and screamed across the mountain like a demented banshee. The wind woke me up more than once. The dogs were restless, too. Baby Dog saw two raccoons in the bird feeders, and you’d have thought we were being attacked by blood-eyed demons. I haven’t gotten much new snow from this latest big nor’easter, but with these winds the roads are closing down left and right. Half an hour after a plow goes through, a road is closed again. I almost didn't make it through the drift up ahead in this shot. I saw it ahead and nearly took the side road to the right to avoid it, only to think about where the side road went and decided that could prove worse further along. So I gunned the car and made it through. It was actually two drifts, one along the right side of the road and a second along the left side. I plunged through the middle where it was marginally less drifted and kept going. That was the worst of my morning commute, thank heaven. So far it’s a pretty little snow. The forest looks sprinkled, each tiny twig or fir needle highlighted with sparkling white. Last week’s snows were already fading to dingy white, but this new storm makes it all new again. 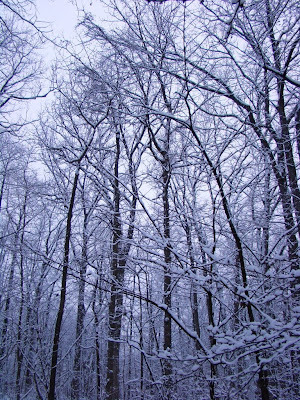 The forest is silent with falling snow, for the moment the expected hurricane winds not yet rising and everything is still. This morning for the first time since the last snow, I saw rabbit tracks. Dog plunged his nose into them and was ready to follow the trail, vastly disappointed when our path diverged from the rabbit’s. For now it’s a pretty little snow. Perhaps it will stay that way. Perhaps not. I will focus on the “now” and see where that path takes me. It’s a good thing that perhaps two feet of the nearly four feet of snow has melted in the past week. Tonight, another foot will fall—or so the forecasters say. I’m not sure I believe them. Every time I listen to a different forecast I hear a different amount. My favorite was 2-12 inches. Now isn’t that a useful prediction? Two inches doesn’t even bother my snow-hating chickens but 12 inches is fairly major. And it’s the 50 mph winds that are likely to be worse than whatever amount of snow actually does fall. Sounds like another blizzard with whiteout conditions to me. So tonight I will be battening down the hatches again. 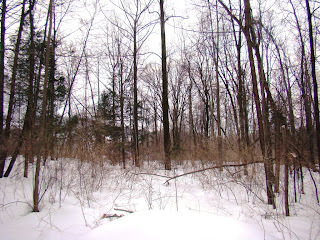 I discovered that it’s hard to show just how deep the snow is when I take photos in the forest. Snow around the base of a tree looks pretty much the same whether it’s 6 inches deep or 3 feet. The tree just doesn’t look any different in the photos. Now, if I cut that same tree down, in the spring you would see that what looked like the base of the tree today was really about 3 feet above the base. But since I don’t plan to cut down any of the trees, you really won’t know that. I suppose I could tie a ribbon around the trees, but really, what’s the point? So just take my word for it that the photos don’t look any different. Tomorrow the snow should be pretty and brightly white again. I guess that’s the bright side. Oh, and my girl scout cookies were just delivered, so I’ll have plenty of sustenance to see me through the next storm. The morning is gloomy around the cabin. Overnight I had rain, snow, sleet and freezing rain all at the same time. Fortunately, I didn’t have much of any of that. As it is also foggy, getting a photo this morning was out of the question, so I will change tack and go for something completely different with this blog post. On Sunday, I let the chickens out, knowing they don’t like snow. I figured the snow would keep them fairly well corralled where they couldn’t wander too far. So when I went back to pen them up after a few hours, I was surprised when I couldn’t find all of them. It wasn’t long before I heard them. They managed to find the only non-snowy area around, which is under the cabin. There they were in the dirt, having a dust bath. They looked as though they were having a wonderful time, all bunched together in one little dirt patch, rolling on their backs and flapping their wings. I think they thought they were in chicken heaven, or at least the chicken equivalent of a day spa. I couldn’t tell where one chicken started and another ended. They were having such a good time I hated to end it, but I did. 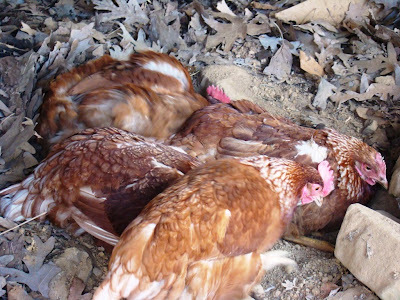 This is my first winter with chickens, and I was worried about how they’d do out in their unheated, drafty, cobbled together chicken pen with a rabbit hutch for a nest box. 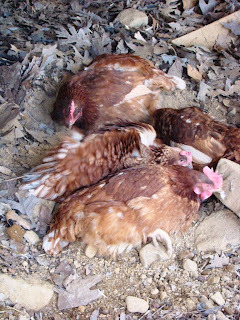 They seem to be doing just fine, and even laid eggs through the winter, when I was told they would not. They even laid eggs through the blizzard. So they deserved their day at the spa—and an extra helping of blueberries. 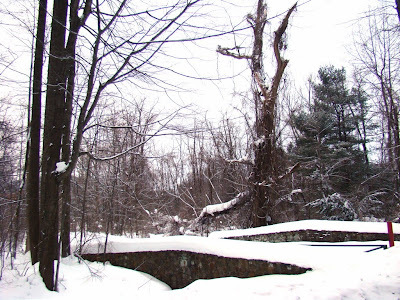 Snow is still hanging around Roundtop even though the weekend temperatures inched above freezing in the afternoons. A fair amount of the snow has melted. I think it's because the snow was of the light and fluffy variety. That water-laden concrete snow doesn't usually melt so fast. Sunday was a very pretty day with a perfectly blue sapphire winter sky. Clear skies are something of a rarity this winter, which is itself unusual for this area. Winter is often quite a pretty season here; many days in a row of sunshine are common. Not so this winter. So when the sun cooperates and the clouds disappear, I have to take advantage of it and get outside with my camera. Normally, noontime is not the best hour of the day to take photos, but in winter, when the sun isn't so high in the sky and the sunlight itself is weaker, I find it a good time. Even at noon, I see shadows playing across the snow. 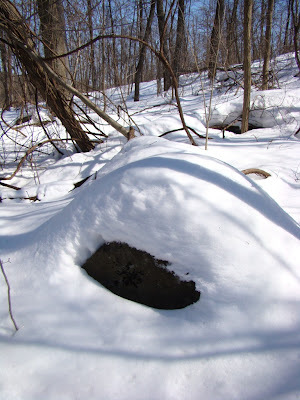 And since there's not too much to see in my woods right now except snow (and shadows), it's a good thing the combination makes for some interesting photos. These may be the last "good" snow photos I post for a while. Rain and sleet and snow and freezing rain are all predicted for the next 24-36 hours, which will reduce the snow quite a lot. I hope that combination doesn't cause flooding, but it sure might. When I wasn't taking photos this weekend, I was digging out my basement drain so the water will have someplace to go, just in case. My last photo today shows just how nicely snow covers up things and makes them look different than they would otherwise. There's a good-sized boulder under this round bump. I like it when snow covers up things I should have brought in for the winter but didn't. The nieghbors will never know--at least not until the snow melts. The two big snowstorms that are still blanketing my area have prompted a lot of nicknames—snowzilla, snowpocalypse, snowmageddon—are the ones I’ve heard most frequently. 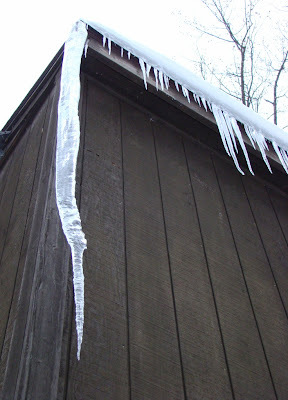 Today, I bring you ice-zilla, the monster icicle currently hanging from the roof of my cabin. It is fully half the height of the cabin, one full story of ice. As the temperature today is supposed to inch above freezing this afternoon, this morning might be its last hurrah. That remains to be seen when I get home tonight. As long as I’m not underneath this icy spear when it falls, that’s fine with me. If it survives to grow any longer, I’ll keep you posted on that, too. The three plus feet of snow I have on the ground at the cabin is compressing a bit. I don’t really think it’s melting—the temperature has rarely reached 32, nor has the sun been out. But it’s not quite as deep as was a few days ago. In a way that makes shoveling it more difficult because the same size scoop of snow now weighs more than before. The birds have found a few bare spots where the snow plows scraped down to the ground. They gather around those tiny patches searching for grit. I have been looking for animal tracks in the snow and haven’t yet found many. I’ve found deer tracks and bird tracks but no sign of mouse, rabbit, fox or anything else in that size range. I suspect most of the smaller animals are burrowed in or hunkered down. The squirrels bound from tree limb to tree limb—I haven’t seen their feet touch the ground, well, the snow, since the storms hit. In other words, not much is going on around the woods at the moment. Even what’s not covered in snow isn’t out playing in the snow just yet. I wonder how long that will last? I have a feeling this blog is going to seem like a broken record for while. Snow dominates my nearly every thought and action, and I expect that will continue until there’s quite a bit less of it than I have right now. Forget snowshoeing or skiing, shoveling is my only outdoor activity. The basics of shoveling are done, of course, but I’m still working on making a path around the house, clearing a door to the cellar. Eventually, I will work on clearing a path to the cellar’s drainpipe. Last night I had a bit more snow but not enough to create more problems. The weather forecast suggests this snow is in little danger of melting for the next week or so, but I’m already trying to look ahead to that and just how this snow will melt. My hope is that it will melt slowly. Very slowly. If it doesn’t, flooding is a sure thing both at the cabin and in the nearby streams. My basement floods in most springs, even those with far less snow than I have at the moment. So I’m trying to open up the drains, gain access to the cellar—which is likely still some days ahead—and do whatever I can do to at least direct the future flow of water and mitigate potential problems. 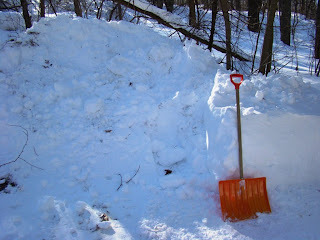 I am still limited by the sheer amount of snow, but I work on it a bit at a time. Sometimes I make some progress only to have the winds drift it right back again. At the moment, there is no end to it and no end in sight. I just keep going, some days faster and more productive than others. Snow continues to dominate my own personal headlines here on Roundtop Mtn. Not much has melted, and shoveling continues, though at a slower pace. I’m tired of shoveling. Tonight, more snow, if not a large amount. I’m trying to decide if several inches of new snow will mean nothing or if it will be the straw that breaks the camel’s back. At this point, I can’t decide. Today, I am posting some more snow photos. Snow photos are all I have and are all I am likely to have for some time. Apparently, I was lucky to get off the mountain on Thursday afternoon. My brother lives two townships over. Unlike me, he lives in a good-sized development, so isolation from a population center doesn’t apply to him. 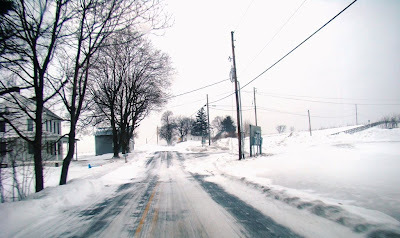 However, apparently the township snow plow(s) broke, and his end of the township wasn’t plowed out until late on Friday. Believe me, it’s a first for me to be plowed out before he is. 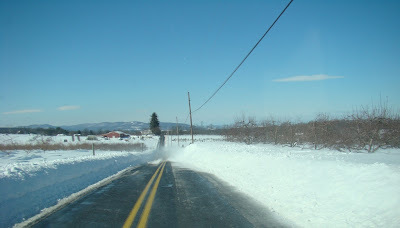 The snow is still drifting and sometimes comes close to closing the roads again. It’s not as bad as it was on Thursday and Friday but even yesterday drifting sometimes reduced the roads to a single lane. The second photo is my back deck. 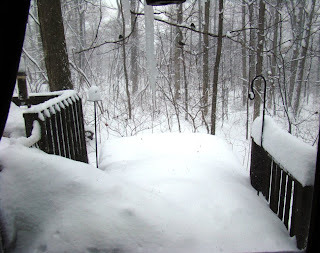 The snow is nearly up to the railing on the left, and the stairs have disappeared. I still haven’t seen any new bird species at my feeders. At this point, I’m going to assume new species will not be found at my feeders this winter. I am seeing some new configurations of the usual species, though. It is rare for me to have mourning doves at my feeders, though when the weather gets bad, I often have a pair of them. That pattern continued until yesterday when 5 showed up—a record. 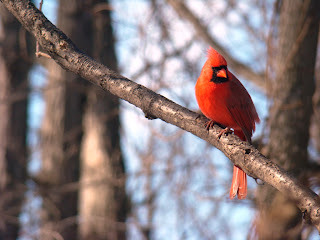 The male northern cardinal has been singing all winter—even the snowstorms haven’t slowed him down. This morning he was answered by one of the Carolina wrens, and they echoed each other back and forth for a bit. Yesterday, a female house finch put on a pathetic performance. My tube feeder has a higher and lower set of feeding perches and was empty down to the higher set of perches. The chickadees were able to sit on the top perch and dip down into the tube for a snack. The female house finch couldn’t fit herself on that perch and eat too, which frustrated her no end. She’d go to that perch, try to feed, eventually give up and return to the branch above it. After a few minutes she’d try the same thing again, apparently not smart enough to go to the lower perch where she could easily reach the food. I watched this for four or five attempts, then simply couldn’t stand it any longer and went outside to fill that feeder. I knew it wasn’t going to be pretty and it wasn’t. Another 20 inches of snow fell on Wednesday on top of the 25-27 inches I’d gotten three days before. The wind blew at 30-40 mph, and most of Wednesday afternoon was a total whiteout. I didn’t lose power, amazingly, so that was a good thing. The governor closed all the roads, including the interstates, even going so far as to plow the on-ramps shut to keep people off the roads. When the snow finally stopped, well, there was a lot of snow. How much snow is there? 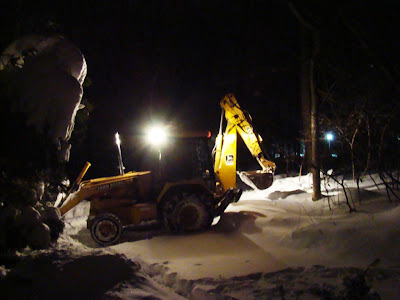 Whenever an experienced driver can get his front-end loader stuck in it, you know there’s a lot of snow. That’s what today’s photo is. Good neighbor Larry getting the front-end loader stuck in my driveway. But it could have been worse. Even the chickens did okay and my little angels continued to lay eggs during the blizzard. I guess you can’t keep a good chicken down. Baby Dog is still having trouble figuring out how to do her business in this much snow. She bounded into the snow on Thursday and immediately sunk over her head. It was hysterical watching her trying to extricate herself. Dog has figured out that if he “swims” in the snow he can get around well enough. The roads are still drifting shut periodically, which is why the kids are still off school. The roads are in good shape if they aren’t drifting closed. The snow piles are huge. In today’s second photo, the undrifted snow is nearly deeper than my snow shovel. At least, I think that’s undrifted snow. You can’t really tell. The birds fed like crazy throughout the storm. I had over 30 juncos on the deck at one point. I still haven’t seen any unusual species, but the Carolina wrens, or at least one of them, made it through this storm, too. I ready to not have any new snow for a while—at least a week without new snow would be nice. 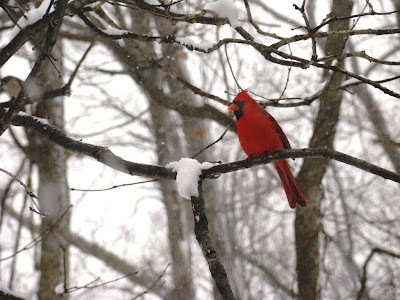 Unlike the pretty Northern cardinal in today’s photos, I won’t be able to say the snow I’m going to get later today will be pretty. On top of my 2+ feet of snow, I will likely get another 18 inches of snow tonight, followed by heavy winds. Yet another nor’easter will hit my area, and I’m really not looking forward this round. Four feet of snow plus winds usually doesn’t equal electricity around here. So keep your fingers crossed for me on this one. The cliché of the day is “where are we going to put it?” After 2 feet of snow, great piles of the stuff are all over the place even now, sometimes so high they impede traffic when you can’t see around a corner or an intersection. 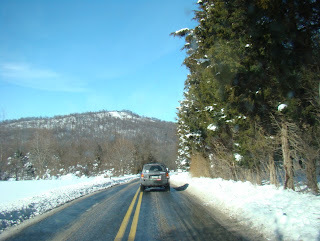 Already, high banks of snow surround me when I drive, making it feel as though I’m in a canyon. Basically, no has yet offered a good answer to where this new snow is going to go. I’m not sure I can shovel something four feet high, so the next few days should be interesting, but perhaps not in a good way. In any event, it would be a good bet not to expect any more posts from me for a few days. 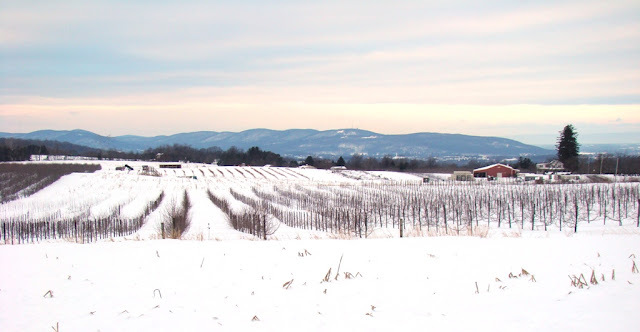 It snowed this weekend, but probably everyone in the country has heard about that by now. What you might not have heard yet is that the forecast calls for another 6-12 inches of snow tomorrow night. I have no idea where I will put that snow. I do know that after a meeting tonight, no matter what time it is, I will be out on my back deck tossing more of what I already have off to make room for more. I probably had 25-27 inches of snow. It’s hard to tell exactly how much because it blew around a fair bit. The good news is that it was a lovely, light and fluffy snow. I’ve had snows of fewer inches that actually caused more problems because it was of the “concrete” snow type. Those snows are so heavy that they can’t be plowed and have to be cut into pieces and hauled away in dump trucks. Those are the kind that really bring down power lines. This wasn’t one of those. Good neighbor Larry plowed me out with a front end loader and Roundtop’s snowcat on Saturday. Even the snowcat couldn’t make it up to neighbor Peter’s house, and he still isn’t plowed out. What’s a snowcat? Remember the movie “The Shining” and that big thing that picked up the family? That’s a snowcat. Yesterday was a beautiful but cold and breezy day. I took a lot of photos outside and after I drove off the mountain. 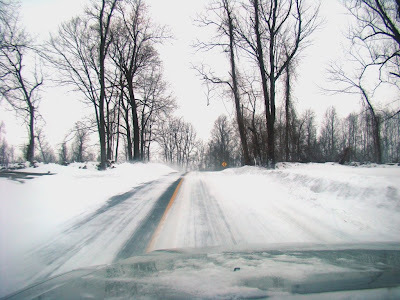 Because the snow was so fluffy and because the road crews did a good job and because the roads were treated before the snow, driving on Sunday wasn’t too bad overall. Some roads weren’t plowed at all when I was out, and I’m told the local cities aren’t in great shape, but where I was, it was fine. 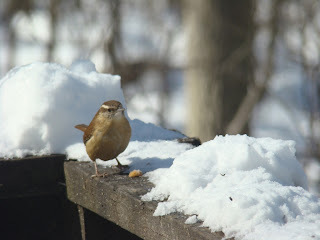 Oh, the Carolina wren finally showed up, so it made it through this storm. I didn’t get any unusual birds at my feeders, though I did have two species that I don’t usually get at the feeders. I had a starling for the first time ever in 20 years and a flicker, which is unusual because they usually leave the mountain in winter, doing a vertical migration down off the hill. So this snow is over, if not yet done with. I’m not looking forward to Tuesday’s snow, though. Stay tuned for that one. No photos until I get back to hi-speed internet. I am currently almost at 2 feet of snow. It is hard to measure accurately because the snow is blowing and drifting. Even the ski resort is closed because we're in a state of emergency and no one is allowed on the roads. I shoveled last night right before bed--had everything clear with about 6-8 inches of snow. This morning, I had to force open my front door, half inch at a time until I could squeeze out. The snow is past Dog's belly and is halfway to the top of his back. Baby Dog looked like she was swimming in the snow. For now we are all safe and sound. Good neighbor Larry cleaned out my driveway and the lane with a front-end loader but at this rate, he may need to do it again once the snow finally stops. No sign of the Carolina wrens this morning. I wouldn't be surprised if they don't make it. All the other birds are feeding like crazy. I'll check in later if I get the chance. I have no photo today, though I feel that’s kind of appropriate. I am in the calm before the unknown of the storm ahead. It’s a cliché but one that is true—at least as it pertains to weather. I make no claims for the accuracy of the phrase’s non-weather uses. This evening’s weather, the storm ahead, like anything that will happen in the future, is an unknown. That’s always a truth, of course, but it seems a bit more pointed on some days than others. At the moment, it looks as though a right blizzard will keep me at my cabin throughout the weekend. The forecast calls for a low end of about a foot of snow and a high end of about two feet of snow. A foot of snow is an amount that can be dealt with. Two feet will be a nuisance. When the snow ends, the wind begins and that may well be the worse part of this storm. In any event, I am currently in the hours of calm before this storm. I have prepared by assuring I have enough supplies for me and the dogs, cats, wild birds and chickens. 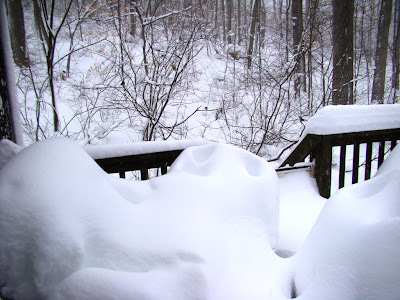 The snow shovels stand like sentinels on the front deck. We should all be cozy, if housebound, for a bit. I am starting to reach an age where I no longer have a joy of shoveling. Many’s the time I’ve shoveled my entire driveway every two hours throughout the night to “keep ahead” of the snow. It’s much easier to shovel 2-3 inches at a time than 15, and I used to take pleasure in how easily and quickly I could clear the snow with what felt like minimal effort. Lately, I’ve found that regimen nearly as tiring as waiting until the storm is over to do anything. Perhaps it’s the lack of sleep, perhaps it’s the extended hours of exertion, I can’t say. For this storm, especially if the snowfall reaches toward that 2-foot mark, I’ll be happy just to keep a path open to the chickens. After that, we’ll see. 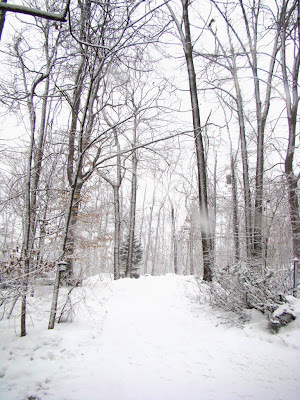 Next blog post: Expect snow pictures! When I woke up this morning, the snow that fell on the mountain last night was still clinging to every branch and twig in the forest. I love it when it looks like this. It never lasts long, especially when the snow is as light and fluffy as this one was. But for a few minutes or an hour, every tiny surface is outlined in white. Often, it doesn’t even take a breeze, not even the barest hint of a breeze, to knock the snow off the surfaces. This morning as I was walking Dog, the air was as still as could be, yet clumps of snow still fell onto us. Even as light as the snow is, gravity soon wins. A snowflake will shift position, and all the other snowflakes on that twig will lose their balance and fall in a clump to the ground. 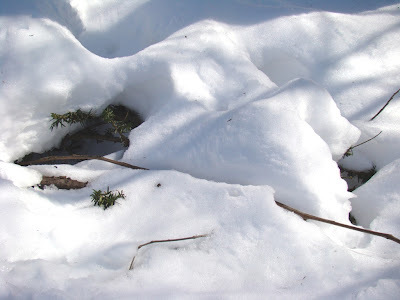 I even found a snowsnake—at least that’s what I call them. 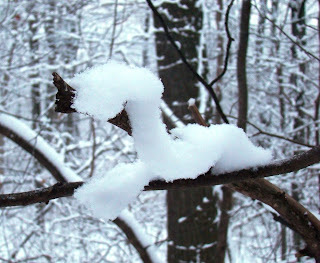 When the snow clings to a branch and then slowly starts to fall, for a little while it can twist into interesting shapes. Sometimes the snowsnake will freeze in place and last for a little while, but that’s not very common. In a way, this one reminds me of one of those balloon horses, more than a snake. So the mountain is snow-covered again and will likely remain so for a while. This snow will compress before long—gravity again, even when the temperature stays below freezing and the sun doesn’t come out. The main reason the mountain is liable to stay snow-covered, though, is because of another storm heading this way for Friday. That one looks like it might go a foot or so. I’ve got the snowshoes ready for that one. 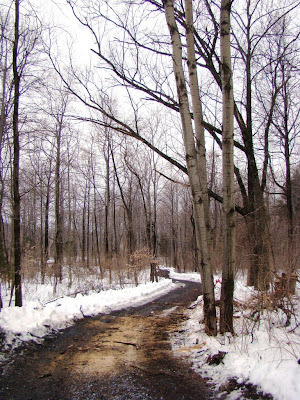 Since last week’s rain, my winter forest has been largely devoid of snow. I can still find a small patch or two of it here and there, but the landscape looks more like November than February at this hour. I say “this hour” because it looks as though that will soon change. The sky looks heavy with snow and grows ever darker. 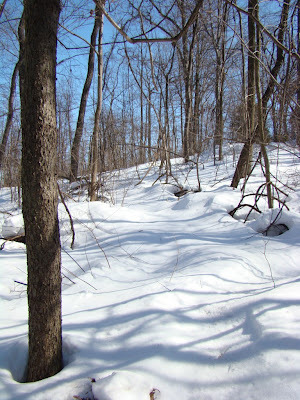 The coming storm will not be a large one, but even a few inches of snow will make the woods look like winter again. Right now it doesn’t look as though I will get a snow day tomorrow, but I might get a snow delay for a few hours. The weekend looks to bring even more snow, so the bare woods in today’s photo will soon be a thing that is so last week. The feeder birds have already emptied my feeders once today. They can feel the snow coming, and want to stock up before it does. I can smell the snow already and know it can’t be long from falling now. Winter is about to reappear on the mountain. The past weekend started out very cold. On Saturday the temperature never got above 15 degrees, with snow squalls and a bone-chilling rawness to the air. So on Sunday when the sun came out, and temperature went above 20 degrees, it was time to come out of my burrow and go for a walk. 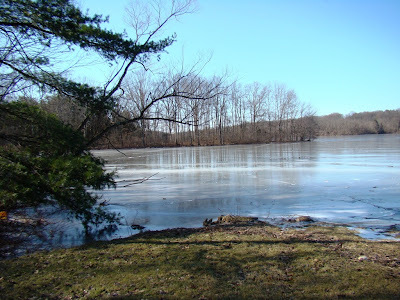 I decided to visit Pinchot State Park, just a few miles from Roundtop. 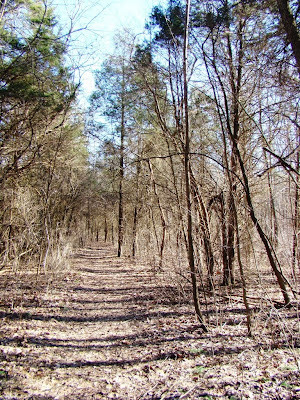 It’s a small change in scenery, as the forest looks much the same as Roundtop’s forest. Pinchot has a nice, big lake, though, and I wanted at least a little change from my own woods. The warmer air felt wonderful, the sun even better. 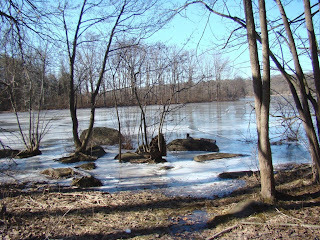 By noontime, the air temperature was nearing the mid-20’s, and the ice began to sing. It sounded like whales singing, with whistles and long groans, a few pops, the occasional snapping of a whip. But mostly it was low, deep groans, as the sun did its work. It was enough to worry the small group of ice fishermen spread out on the lake. Some headed for the shore, most moved closer to the shore, a few dug new holes, rechecking the depth of the ice to assure it was still okay. They all seemed more nervous once the singing started. I thought it was a beautiful sound, music to accompany my walk. The sound followed me even when I wasn’t next to the lake. I could always hear it in the distance. Up close, the sound reverberated all around me, an unexpected symphony. I stayed longer than I’d planned. The concert went on an on, and I didn’t want to leave.